The TI-32 Explorer Plus is another calculator introduced by Texas Instruments to perform fractional arithmetic for elementary school. 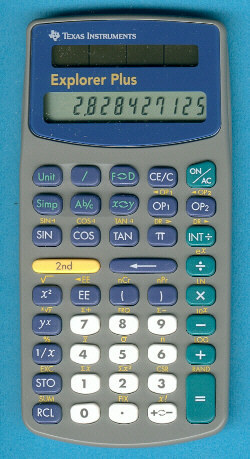 In Europe the calculator was sold as TI-40 Solar. In a France the similar TI-40 Collège uses batteries instead the solar cells. Compare this stylish calculator with the first version of the TI-32 Explorer Plus. The same housing was used on the simpler Math Explorer and a short time for the TI-30Xa SE. Stokes Publishing Company, Inc. based in Sunnyvale, California sold a companion for the teacher, view the wonderful Intermediate Plus. Math Explorer™ is a trademark of Texas Instruments. © Joerg Woerner, July 4, 2002. No reprints without written permission.